Simple Marketing Blog: AOC2: Don't Be Myopic About Social Media! All three books in the series feature chapters written by bloggers from around the world who share unique perspectives and valuable insights. The first Age of Conversation, published in 2007, included 103 bloggers from 24 states and 10 countries participated. Age of Conversation 2: why don't they get it? came out in 2008. 237 bloggers from around the world contributed. 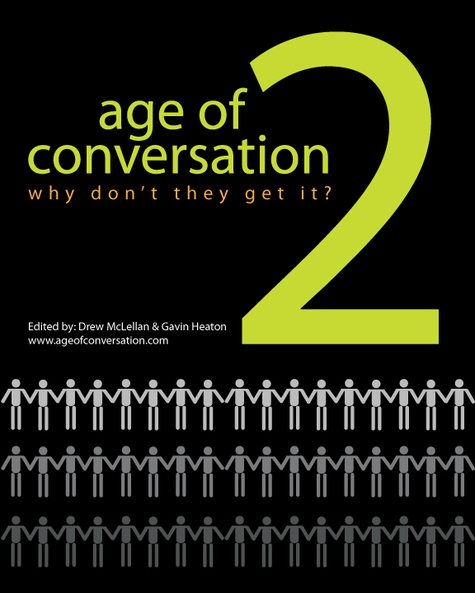 Here are a few tastes: my chapter from the first Age of Conversation, The Conversation Age Enabled and, in this post, my chapter from the second Age of Conversation (AOC2): why don't they get it? It was featured in the Business Model Evolution section. I've also included an audio file I recorded of my chapter. Don’t Be Myopic About Social Media! Do you remember Theodore Levitt’s Marketing Myopia about defining something too narrowly? Move forward to today’s Age of Conversation, enabled by social media tools - like wikis, blogs, social networks, and RSS - that many define too narrowly. Rather than embrace such tools to facilitate interaction, create conversations, enable collaboration and democratize knowledge, many shut their eyes/ears/brains. They become myopic forgetting how things were done – not that long ago – before email [remember memos and carbon copies?] and cell phones [vs. pay phones?]. Those tools radically changed how we conducted business. We became effective beyond a desk and outside an office. Our reach grew, our productivity increased. Imagine going even farther, becoming more relevant to customers and end users, developing solutions once impossible. Imagine going from myopia to ever improving vision, by taking part in the Age of Conversation! The Age of Conversation engages those interested in participating, transforming customers once antagonistic toward your sales efforts into advocates willing and eager to promote you and offer new input, serendipitous examples and unexpected suggestions. Social media becomes the means to bringing together those passionately interested, creating a community rather than an indifferent audience, quality over quantity, holding even greater potential for revolutionizing business and strengthening brands. So why don’t people get it? Luckily, a few start experimenting. They highlight best practices in the industry, showcase passionate voices and invite new perspectives in. Before you know it, their efforts are no longer scoffed at, although skepticism remains. Although mass communication tools aren’t abandoned, you begin to see interest in developing conversations with consumers and customers. I consider this step 1. Those too traditional in mindset to appreciate the difference between having a blog and engaging in the conversation continue not to get it. The larger the organization, the more entrenched in traditional communication approaches, the greater the resistance and the confusion. However, the nimble ones, often with limited resources, take note. They take those concepts to another level, becoming personally invested in content quality, integrating efforts and demonstrating the joy inherent to better vision, to shedding myopia and seeing forever. I consider this step 2. Conversations that had never before taken place happen, between neophytes and experts, unrelated specialists, end users and creators, all working together in the Age of Conversation to bring meaning and value to an otherwise old economy industry. They start to get it. I consider this the beginning.